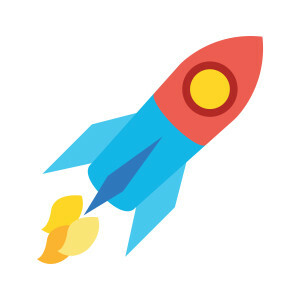 Getting people to reply to your email isn’t rocket science. But it can be a lesson in social psychology. When we dug into our database to examine over 500,000 sales emails sent by Yesware users in Q1 2014, we discovered that emails sent to one person while copying another had a reply rate 12% higher than emails sent directly to two people. What’s going on here? Let’s take a look at the data. Get all the data here in our ebook, The Ultimate Guide to Sales Email. 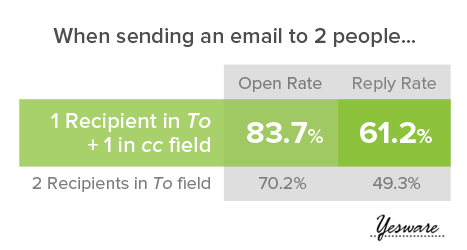 Sending one email to multiple people improves both open rate and reply rate, according to Yesware’s analysis of over 500,000 sales emails from more than 1,000 anonymous inside sales professionals. The data even suggests that emailing three or more recipients increases the likelihood of getting a response, as illustrated in the chart below. When a task is placed in front of a group of people, individuals are more likely to assume that someone else will take responsibility for it. Recent studies have demonstrated a similar line of thinking when it comes to peoples’ helping behavior in response to group emails. In an experiment conducted by Blair, Thompson, and Wuensch, 400 undergraduate students were sent a fake email from a new student asking for advice on how to access an online database. The email was sent to groups of either 1, 2, 15, or 50 students at a time. Consistent with diffusion of responsibility, the researchers found that participants were less likely to respond when they believed other people had also received the email. Think about it: The dynamics of one-to-one communication are too complex to assume that just because you sent an email to two people, someone is bound to reply. When sending emails to two recipients, try sending it to one and copying the other. This implies that one person is solely responsible for taking action, while also harnessing the power of social proof to further encourage their reply. Each week, we’ll be sharing new Yesware data insights to help you sell smarter. You can catch all the posts in the series here.